Authors of the Calé Fragranze d'Autore range of eaux de toilettes, Italian perfumers Calé are soon set to release a new duo of perfumes in the line. These will not only compliment Calé's existing portfolio of perfumes, but also usher in a new dilution for the line: Les Concentrés. Roboris and Fulgor are fragrances with a particularly high perfume concentration... greater than that of eau de parfum. Both were inspired by Director Silvio Levi's experience in the blistering heat in Death Valley, when from out of nowhere, a sudden thunderstorm struck and raging flashflood appeared. The experience left a two-fold mark on his soul: the first immediate, violent and wild, and the other; thoughtful, harmonic and embracing. Fulgor, created by Maurizio Cerizza & Silvio Levi, channels a sensation of imminent, grandiose unstoppable power ready to burst forth... a violent manifestation of nature in all its bone-chilling glory. Fulgor embodies the relentless desert heat, but the air is also charged with electricity. Deep blue-grey clouds are heavy with rain and a zephyr picks up... a precursor to the impending deluge. Opening notes of fig and green tangerine rush over a warm heart of saffron, magnolia and narcissus - these components lend a 'can't-catch-your-breath' feeling of oppressive heat. Patchouli and incense bring an earthiness to the perfume, whilst two very unique 'graphite' and 'pyrite' accords suggest a sense of dryness, like porous desert stone and sand. If struck together, one would expect sparks to appear and a wink of light. There are opposing elements at play here... contrasts in humidity and temperature which make Fulgor a very unique and compelling perfume. For Roboris, Levi teamed up with perfumer Mark Buxton to explore a different aspect of the desert thundershower... a interpretation as much spiritual as it is physical. Levi's narrative details a Native American Indian in a desert highland, giving thanks for the imminent rains... the life source that will ensure renewed growth and prosperity for his family. Roboris is a scent which unifies delicate florals such as jasmin, violet and wisteria with cactus flower, vetiver, sandalwood, tonka and ambergris. It feels much greener in its approach, however a sense of the parched, thirsty land lying underfoot is also very vivid. It is a fragrance which is etherial, in celebration of the Great Mother and all her gifts; but it also remains earthbound. This is a perfume that expresses positive strength and gratitude. In addition to this brand new fragrance duo, Calé continue to explore concentrated dilutions with the re-release of several of their eaux de toilettes, now in concentrated form. These include: Allegro con Brio, Ozio, Assolo and Brezza di Seta. Have your ears ever been flooded with the sound of nothingness? The ear-splitting hum and jet-engine buzz of silence? Indulge me and imagine, if you will, a vast wintery landscape in northern Finland... a place still unspoiled by the invasive tendrils of man, where the sky is fathomless, and the point at which it meets the horizon, vitreous. Nature, in its purest, most undiluted form, has a drone of its own... one you're never truly conscious of until you train your ears to it. It's like the thrum of the refrigerator in the next room. Resolute, cold and unabating. It is in this particular environment that the Nordic nations have flourished for millennia, and indeed one that has influenced their culture, lifestyle and design vernacular. Artek is a Finnish furniture company that has existed for over 75 years, and one which prides itself on the preservation of conceptual design sensibilities and technical expertise in production. Doing away with frivolous ornamentation, their aesthetic embraces the pure and simplest forms and materials found in nature. In 2009, Artek collaborated with designers/perfumers Comme des Garçons to create Standard; a fragrance whose intent was to remain analogous with Artek's design ideology. 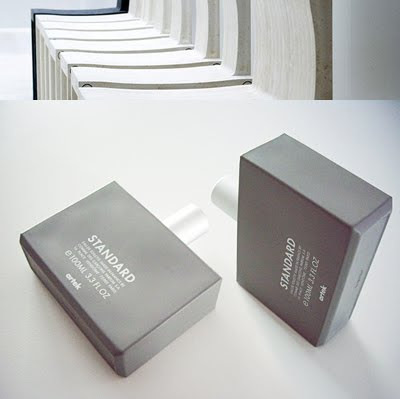 Standard is a unisex scent, packaged in a stone-grey matte glass flacon, which is surprisingly cold to the touch. Although at first glance the bottle perhaps resembles an uninteresting basic building block, it is distinctly Scandinavian in style: straightforward, stark and unadorned. The scent itself is equally as austere, and I think therein lies its beauty. Comme des Garçons are masters of their craft... here they've created a scent that captures the bleak cold of a Scandinavian night; frigid, unpolluted and unrelenting. There are fascinating synthetic accords of metal and corrosion present that speak of Artek's architectural / manufacturing heritage, which are cleverly juxtaposed against components from the natural world. There are crisp lemony / green nuances that are played off against tea leaves, blonde woods and saffron. I feel if there were ever such a thing as 'green frankincense', then it would smell like this. Standard, though flinty and somewhat unemotional, is a triumph in that it represents the clever marriage of conceptual ideas from both celebrated houses. It embraces the avant garde for which Comme des Garçons are renowned, but also pays hommage to the landscape and aesthetic enjoyed by the Finnish. Standard lasts approximately 8 hours on my skin, even if applied sparingly. One to be tried.